On McLaren MP4-23 At HockenheimIt just appears like every other week a team introduces its own shark fin engine cover, named by McLaren as a "top body dorsal fin". What's in a name. Needless to say, the item works similar as with Red Bull and its copycats, helping to maintain the car's stability while cornering. The rear cut-out around the rear wing's leading edge is at the same time preventing that the rear wing's efficiency would decrease when the car is in considerable yaw. It's now a waiting game to see when Ferrari of BMW will come up with it, but don't be surprised if that's somewhere during this Hockenheim test too. On Williams FW30 At GP FranceJust as most other teams, Williams have now also developed a downward extension to the sidepod panel. The approach differs from what is already on competing cars as the lower end does not directly connect to the barge board. Instead, the floor was extended to create a base for a connection point. On the upper side, Williams have also taken the chance to develop their sidepod panel further and enlarged it towards the front wheels. All in all a very elegant solution to condition the turbulent airflow behind the front wheels. 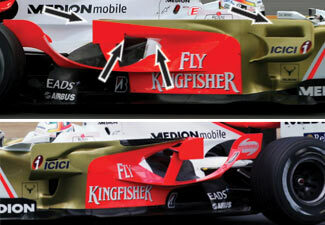 On Toyota TF108 At GP FranceWheel fairings have become fairly normal by now, and most teams have identical designs. At the rear, every team used a fixed shield with a central opening, both allowing the mechanics to fit the tyres and to provide an exhaust for brake air (and dust). Toyota have now given a new twist to it as they designed a venting shield. 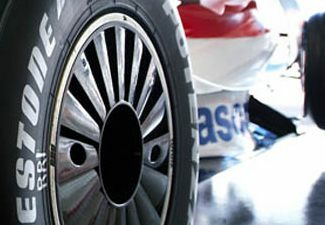 Instead of a closed carbon disc, the element consists of small, identical aerofoils that allow hot air to escape from the wheel. More specifically at the upper half of the wheel, the rotational speed and the airspeed around the wheel will cause brake air to be drawn away, effectively increasing the cooling capacity. A similar shape can often be recognised in the arms of road car wheels, although these mostly direct air into the wheel, rather than out of it. On Force India F1 VJM-01 At GP Great BritainForce India have finally got rid of the huge chimneys that the car is featuring since the inauguration of the team. The team now developed a new sidepod cover that effectively closes the chimneys and adds a considerable amount of shark gills to provide enough cooling for the engine. The upper image is the new design as seen at the British GP, while below is the version used at the French GP. 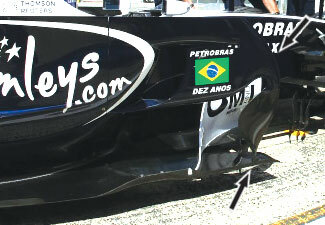 The image clearly shows how the winglet's outer endplate is now a continuation of the closed chimney panel, similar to Ferrari. Below the winglet is now more open space to pull more air towards the centre of the car, helping downforce at the rear end. At the same time, the sidepod panel has been redesigned with a large slot, now also more similar to Ferrari, despite the panel's tighter integration with the sidepod. In spite of these aerodynamic improvements, the team decided now to change the frontal shape of the sidepod. While an undercut would benefit the car's performance, such redesign would also involve changing the side impact crash structures and require a new crash test. 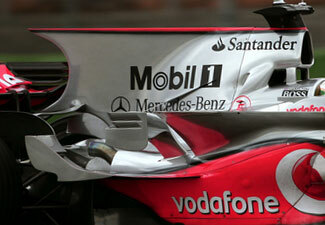 Apart from the sidepod improvements, the team also introduced a new shark fin engine cover. I know most of us just want the cars back to how they were in the old days, and I'm sure the racing would be better as a result, but seperate to that, I like watching each team find ways to improve aero as above. I for one actually thing all the winglets look kinda rad. I'm a bit of a kid I know. It's just, the cars from decades back look kind of boring to me. When was the last time an 'ocker was easily pleased though Nate? I like the aero too...and one day they'll come up with a wing that doesn't disturb the air. It's. All. A. Matter. Of. Time. And active suspensions to control the ride height (amongst others). You are not alone. I like the aero oddities too. I too like all the aero bits and bobs on the car. There's an elegance of sorts to the aero complexity. I guess if it doesn't flex, they'll let em keep it. As far as I'm aware the term is "moveable" which is why all the hub-fairings don't move on the cars at the moment. Does the Toyota one rotate? Has this been confirmed? If it's integral to the wheel - i.e. the spokes - then it would be legal, but if it is an additional item it would be illegal. The venting wheel fairings on the TF108 are fixed to the hub as far as I'm aware.